2018 Legislative Conference established 2019 Legislative priorities. The Legislative Conference is an annual event that usually takes place the Sunday after the fall election. 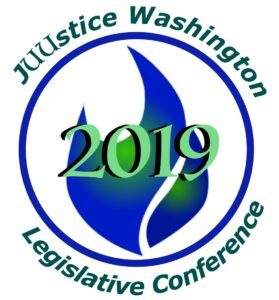 The purpose of the conference is to set priorities for the following legislative session in Olympia, based on discussion of major issues by members of Unitarian-Universalist congregations. Individual Unitarian-Universalists are encouraged to follow up the Legislative Conference with contacts to their legislators, or campaigns for initiatives in their districts. We do not support campaigns for individual legislators or candidates. The 2019 legislative priorities that were voted on at the 2018 Legislative Conference can be found at the Legislative Priorities webpage under Legislative Advocacy.